This collection of essays focuses on the work of James D. Marshall, who has been active in the philosophy of education for three decades. Discusses his work considering the relevance of Wittgenstein and Foucault for philosophy of education. Features tributes to Marshall in the form of interviews and testimonials. Contains remarks from Marshall himself in response to the commentaries of his colleagues. Paul Smeyers is Professor at K. U. Leuven (Belgium) where he teaches philosophy of education and qualitative research methods at the Faculty of Psychology and Educational Sciences. He published extensively on Wittgenstein, Anglo-Saxon philosophy of education, postmodernism and on the nature of educational research. He heads the research community Philosophy and History of the Discipline of Education: Evaluation and evolution of the criteria for scientific research, which was established by The National Fund for Scientific Research, Flanders, Belgium (Fonds voor Wetenschappelijk Onderzoek - Vlaanderen) since 1999 involving 15 centres world-wide. Michael A. Peters is Professor of Education at the University of Illinois at Urbana-Champaign, Visiting Professor at the University of Glasgow, Adjunct Professor of Education at the University of Auckland and Adjunct Professor of Communication Studies at the Auckland University of Technology (NZ). He is executive editor of Educational Philosophy and Theory and co-editor of two international online-only journals, Policy Futures in Education and E-Learning. He has authored or edited over 30 books in these fields. Introduction: Michael A. Peters and Paul Smeyers. 1. Jim Marshall: Foucault and disciplining the self: Tina Besley. 2. Autonomy, Agency and Education: He tangata, he tangata, he tangata: Nesta Devine and Ruth Irwin. 3. The Paradox of the Excluded Child: Bruce Haynes. 4. Emergencies and Emergent Selves: Felicity Haynes. 5. Education as Liberation: The politics and techniques of lifelong learning: Bert Lambeir. 6. Testing Resistance: Busno-cratic power, standardized tests, and care of the self: Cris Mayo. 7. Foucault, Educational Research and the Issue of Autonomy: Mark Olssen. 8. Marshalling the Self: James D. Marshall as Educational Philosopher: Michael A. Peters. 9. Marshall—Making Wittgenstein Smile: Robert K. Shaw. 10. The Labouring Sleepwalker: Evocation and expression as modes of qualitative educational research: Paul Smeyers. 11. 'What it Makes Sense to Say': Wittgenstein, rule-following and the nature of education: Nicholas C. Burbules and Richard Smith. 12. Lightning and Frenzy: Music education, adolescence, and the anxiety of influence: Paul Standish. 13. Break with Tradition: Marshall's contribution to a Foucauldian philosophy of education: Lynda Stone. 14. Photograph and Curriculum Vitae and Major Works of James D. Marshall. 15. Interview with James Marshall: Paulo Ghiraldelli Jr.
16. James D. Marshall: Philosopher of Education: Michael A. Peters. 17. For Jim: My friend: Kevin Harris. 18. Stone/Marshall Wedding Address: D. C. Phillips. 19. Fragments of Life before Foucault: Colin Lankshear. 20. James D. Marshall Reply. "A New Zealand philosopher of education, Marshall has researched and written widely on the positivist influence on education and the relevance of Wittgenstein and Foucault for education. These essays, by former students, colleagues and acquaintances are an appreciation of and for his work . . . One of the interviews (with Michael Peters) is particularly insightful and suggestive for students of education." 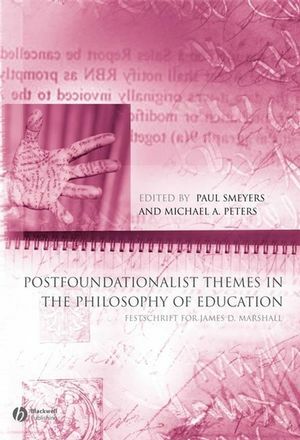 A collection of essays focusing on the work of James D. Marshall, who has been active in the philosophy of education for three decades.